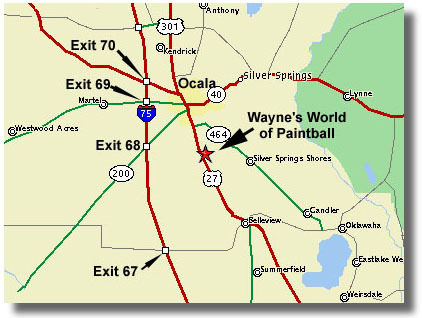 Wayne's World of Paintball is located just south of Ocala on Highways 441/301/27 (Pine Ave.). As you can see from the map, the field is easily accessible from Interstate 75. (we are located about 10 miles north). From the north - Exit 350 (Old 68) - make a left turn onto Hwy. 200. Travel east until you reach 441/301/27. Turn right, and travel about 3 miles south. (If you turn right at the Walgreen's/Target Stores YOU ARE NOT ON Hwys. 441/301/27. The entrance to the field is located at 4841 S. Pine Street, directly across the street from the Ocala Drive-In Movie Theater screen. Located between PC Mobile Homes and Raintree Mobile Homes the entrance drive will be clearly marked. Follow the entrance drive through the gate at the top of the hill. You will be in the camping and parking area, continue to the pavillion.